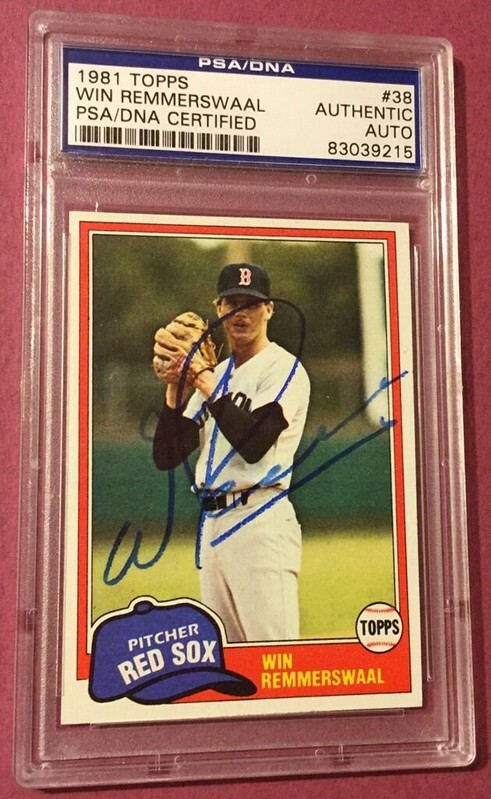 I was thinking it may be interesting to identify some of the tougher 1970's & 1980's Autographed Cards that may not be super obvious to many collectors, a la the 1987 Ricky Wright card. There are some easily identified players/managers that are hard to find due to early death, accident, fleeing the country or just an unwillingness to sign autographs but I think it would be interesting to hear some of the less obvious tough guys. If this thread doesn't get a lot of action I will let it die but I honestly think it would be interesting and I also think we can all learn something from it as well. I would like to periodically update this initial post with new players as they get identified. Feel free to show your cards as well. Who are some other guys that you have had a really hard time finding? A few of those guys are not difficult to find at all on cards, depending on what card you are looking for. Donnie Moore for example signed quite a lot before he passed on 1989. Finding his signed 1989 and 1988 cards can be tough but earlier issues are fairly common. It's an important distinction to understand why his signed 1984 Fleer might be a $5 card while his 1989 Fleer might sell for $100. Very true, not implying all cards signed by those individuals are extremely rare or anything, but some if not all have specific cards that are very hard to find. 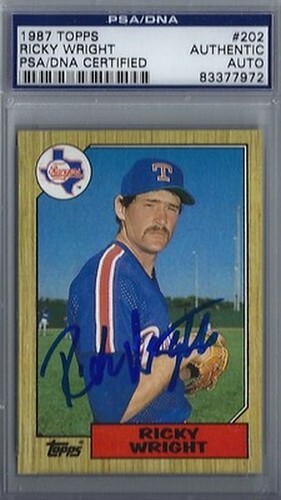 That being said even the most common of Donnie Moore signed cards is tougher than a Vance Law. We can certainly get more specific on certain cards if we get more action in the thread or if someone wants to do that. Those are a few I can think of off the top of my head. There are probably several more obscure players that set builders could share. 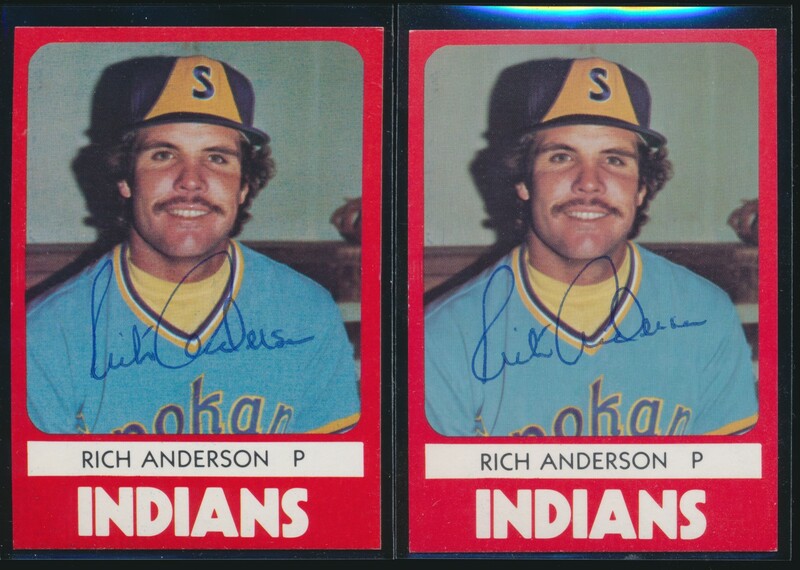 I know the 1981 Topps Rick Anderson (Mariners rookies card) went for over a grand earlier this year. Anderson died not too long after his career ended (his life had later a turn for the worse after baseball) and the story goes the 400+ pound Anderson died with an autograph request in his hands. I also heard directly from Ron kittle via Facebook after struggling to find it, that he only signs his 84T for a $25 donation to Indiana Sports Charities. Considering he signs for free TTM quite freely, this card might be significantly tougher depending on who was willing to spend the $25 for it. Doug Flynn also has one like that. I think it was 86T, but that can easily be checked. 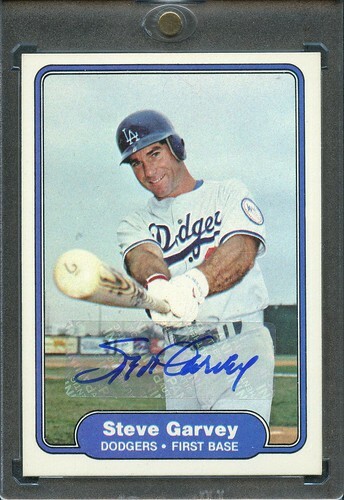 82 Fleer Garvey is another that supposedly is not signed. I saw one sell a while back (maybe by someone on this site even) that looked fake to me, but was graded/certified as real. It sold for crazy money. Gary Carter charged $25 for cards from 1984 to present, then after his HOF selection changed that to all cards. Still feel like there are a ton of cards signed by him out there but some issues might be tougher to find, such as his cards from update sets of the 90s and others that weren't as available at the time (i.e. readily found in packs). Wish I had joined this party earlier, but I've been on a key in Florida without wifi for two weeks. Just back the other day and haven't had time to post. Lyman Bostock Jr: Not terribly tough to come by and there are usually a handful on eBay if you want an example. You might have to wait for a particular year to add it two your set, but even 78's pop up occasionally. I assume he was a great signer before his death. Joe Desa: Tough, especially on Topps. I might see one a year. His 86 Donruss seem to much easier to acquire. Bo Diaz: Not especially tough until you get to 1987. He was a great signer TTM from what I've heard. I've added him to my early-mid 80's set for less than $30 often. 87's are tough to come by because it's the most widely collected set, but can be found. 88's don't pop up often. I've seen one authentic 89 Topps and one 1989 Fleer sold I starting watching a few years ago (didn't save a scan of them.) I've never seen a signed 1990 Topps, Donruss, or Upper Deck. I doubt they exist, save for maybe 1 or 2 examples. They only purported sale of a 1990 signed Bo Diaz I've come across is a 2011 Collect Auction signed set that included Bo Diaz and although they scanned about 30 cards for the website, they didn't seem it necessary to scan the most important card in the set which I found odd because Collect Auctions handles more signed cards and sets then any other auction house and they would have known how rare it was. Steve Macko: Ultra rare. The heavy hitting set collectors I know always quote between 2-5 examples when they talk about it's population. I've seen one I believe is good and haven't yet seen one for sale since I started watching. This card is near impossible as Ezcano is tough too. Win Remmerswaal: Very Rare. 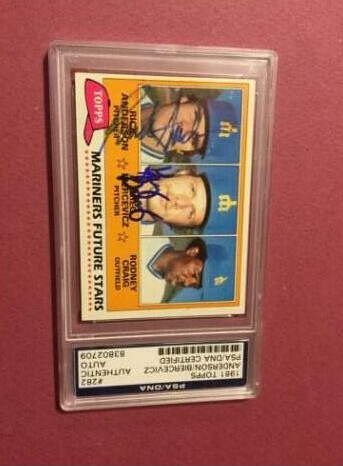 I think this card is in the 15-20 authentic signed examples range. It's the "famous" tough card from 81' but the Macko is tougher and Anderson w/Craig is impossible. With the those two however, you can get Martz or Biercevicz for cheap and call it a day. There is actually a Remmerswaal on eBay now that I've been debating pulling the trigger on but I'm not 100% liking it. 82 Fleer Garvey: He won't sign it. A member here bought one raw on eBay and got it slabbed a few years ago. I didn't keep a scan of the card, but I remember not liking it at the time. Could be wrong. Haven't seen one I like since I started tracking it. Probably a $1000 card 100% authentic, but I made this for less than $10. It'll work for me. 1990 Leaf Kelly Gruber: He won't sign it. Signed some for his kids. This set is becoming very popular with set collectors and will probably become the next Garvey. Haven't seen one, but also haven't been watching as I don't collect the set. 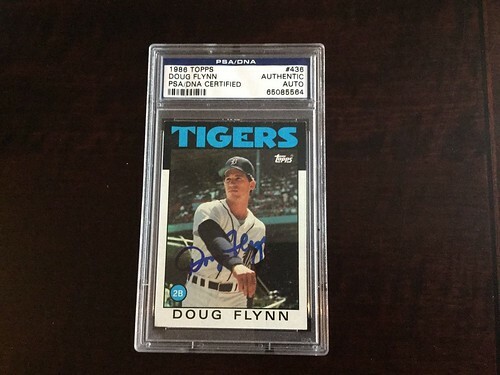 1986 Topps Doug Flynn: Doesn't sign it, except for rare occasions. He signed 5 a charity auction for $400 a pop when pressed to do so. They were the only five on the market. One of the guys who bid $400 convinced him to do more signings for that particular card at the same price (he says it wouldn't be fair to those that bid $400 if he signed for any cheaper.) So it's tough, but if you need him for your set you can get him - once a year for $400. 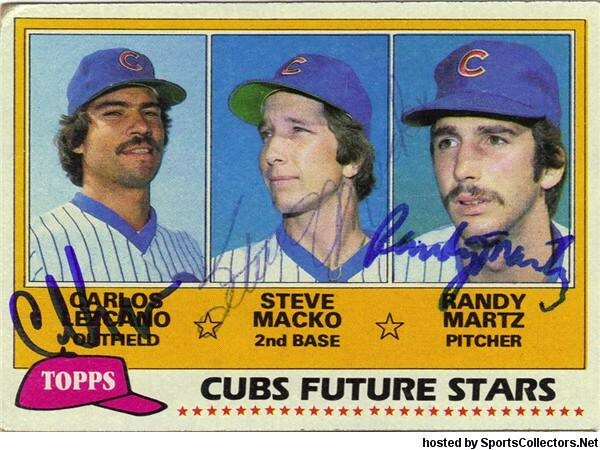 THE IMPOSSIBLE: 1981 Topps Rick Anderson, Greg Biercevicz, Rodney Craig: Doesn't exist that I know of completely signed. Anderson was a recluse after 81 and most know his story. Rodney Craig was a terrible signer during his career and was homeless with mental problems for a long time following his career. I've seen one authenticated example featuring Anderson and I don't like it. The legend is the former owner of the authenticated Anderson tracked down Craig and set up a signing. He showed up, freaked out, and left. Six weeks later he was dead. The owner then sold the card, I believe KO bought it for $3k +. 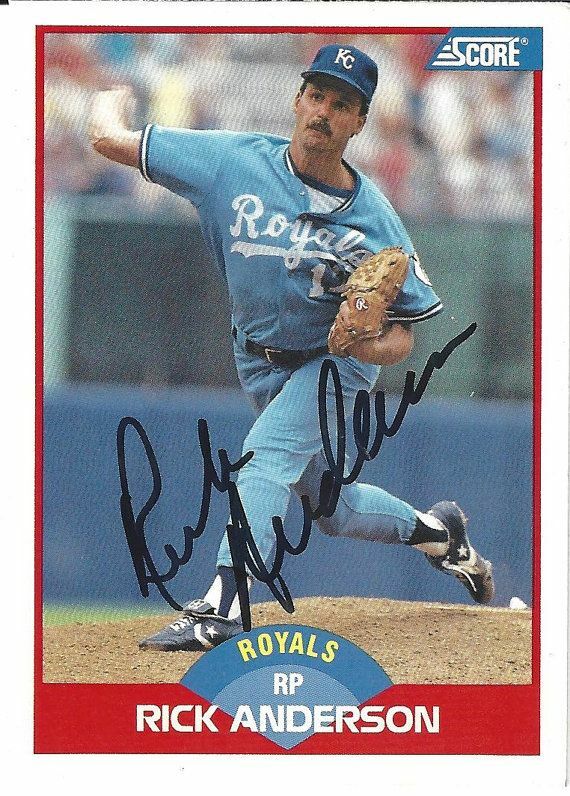 From the only photo I've seen of the card, however, I believe either A) it was signed by former Mets/Royals Rick Anderson, or B) someone forged it in the vein of Mets/Royals Rick Anderson because they were sloppy. The original owner had an amazing collection, but the signature was so atypical I couldn't accept it. Far as I know, this card doesn't exist. Anything with Steve Hovley on it is tough. Any signed stuff of him I believe is from the early 70's and they don't come around often. Some more: Steve Senteney in the 1983 Donruss set passed in 1989. Are Anderson and Wright tough on other media? I have Anderson on an index card and Wright on a team issue photo. I don't really track other media, but I venture that they would still classify as "tough", Anderson more so than Wright. I've seen a handful of Anderson index cards and PC's the past couple of years, but didn't track sales. I'd imagine an authenticated index would bring a couple hundred to a roster collector. I've seen a couple Fleer Wrights sell in the $50-$100 range. He's tough because he just won't sign and he's the sore thumb in the most collected signed set of the past 40 years. Just a guess - maybe ~$100 for a single signed item and his signature probably adds half that value to a multi signed piece. All things considered there are a couple dozen guys that are easily a rarer signature from the 80's but he's probably the most well known in the hobby due to his 87 Topps. I'd always heard Wright readily signs his other cards, just not the 87T. Seems like I've seen quite a few 83F over the years. He was notoriously difficult to get; IIRC, he refused to sign anything related to any team he was no longer with, especially the Reds. It's always about the medium. Cards have most always outsold flats, and therefore even the year or brand will always bring a premium. Just like the guys who won't sign certain cards, ones issued close to the date of death are usually the toughest. Guys like Mike Miley nust have just sat around signing because his other years are unusually pleantiful for someone who passed so young. Signed '86 Topps and Donruss cards of Ramon Romero are very tough. Legend has it he was killed in a drug deal in New York City in the late 80s. Efforts to find him in the DR apparently were stymied by the fact that there was a different Ramon Romero playing in the White Sox organization at the same time. Good one. Myers was very difficult after his first full season in the majors. He would only sign cards from the current year (and dated them) then became current team/current year after his trade to Cincinnati. A couple years later he basically just stopped signing altogether. I guess he got tired of explaining his weird rules to people? 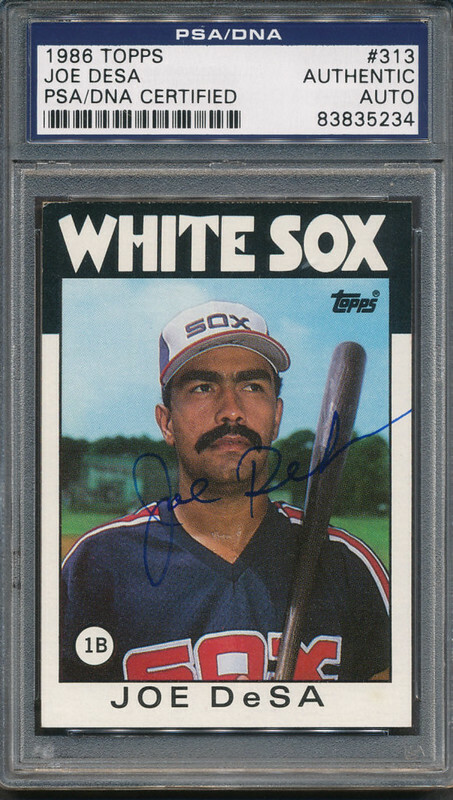 I haven't tried to get him, but somewhere along the line I heard he mentioned once he would never signed his Topps (86 traded or 87) and that he would sign his Fleer for $500. If that's true or if he had any takers I'm not sure. I believe, though I could be wrong, that most anything signed by him is period signed. Interesting for sure. He must have guessed correctly that the only way his cards would have value was to create it. How about the Latino guys whose careers ended before the internet boom? There have been private signings in those countries since, but I'd think a lot of them are still pretty rare. Guys like Juan Espino, Salome Barojas, Enrique & Vicente Romo (especially their 1983 issues), Jose Román, Vic Mata, etc. Thanks. Wow, so it was confirmed. That was a big mystery for awhile. I have several Wright cards that are not the 87T and I have him on balls and a team sheet. I don't know if his habits changed to include everything more recently, but his signature on something other than 87T is not easy, but not hard either. I have been loosely tracking Anderson stuff lately because when I saw the 81T pop up that sold for over a grand, I practically crapped myself. I figured it was hard and expensive, but I just couldn't believe anyone would pay so much for one. Goes to show completists with money to burn can set the bar higher than imaginable. 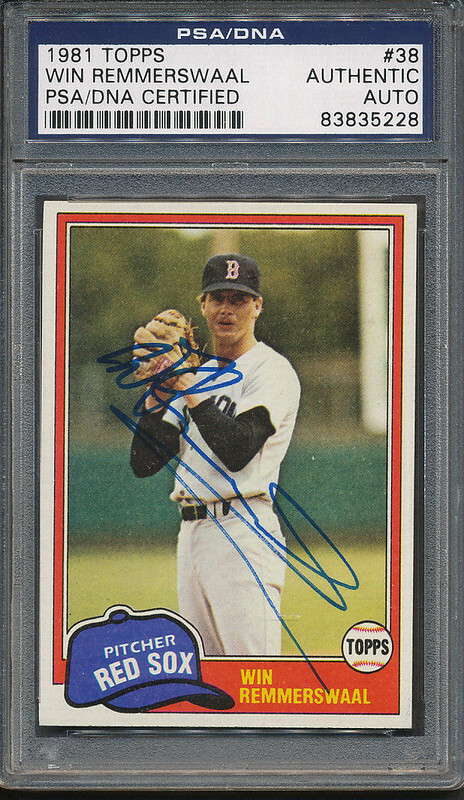 terry forster signed 1987 topps seems hard to find. Past Pros just had a private signing with several guys (Mario Mendoza, Enrique Romo, Jose Pena, Carlos Lopez, etc). That should help offer more supply for those guys. 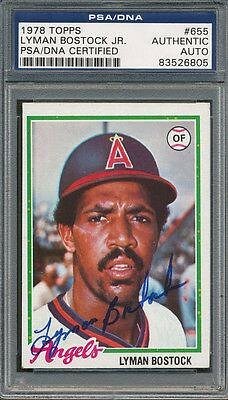 I generally take notice of many of the tougher cards because I just like older signed cards, but I also need the player to have some sort of meaning for me. If they won an award, was an AS, or set some sort of record, I will try for their auto. If they played for the Dodgers or were on a Dodger card, then it is a MUST and if they had a Mariners card from 1977-1987, then I chase those too. That is how I found out so many Mariners were harder than they should be given the player careers they had (you'd think most would enjoy a request for a signature)! There is one that never gets mention in these types of conversations and seems to be insanely hard that I stumbled upon by accident. I had obtained a 72T Ray Newman card (Cubs) sometime along the way (it was in a lot I won). Didn't care about it and it sat in my extra vintage box. Then I decided to catalog cool cards I wanted signed and a lot of the 73-74 Topps are on that list because of the great action poses. Ray Newman has a nice action pitching card in 1973 while with the Brewers. I don't look all the time, but have only seen one listed ever and it went for about $100! I have seen no other 72T signed Newman either. He is apparently still alive, but he must not do much signing, if any now. Traxler's only cards are from 1990 Donruss Rookies and Topps MLB Debut. Both are boxed sets that weren't as easy to obtain or as mainstream as the stuff from packs. He died fairly young from severe alcoholism but was a coach in the Dodgers system for a few years after he was done playing. Last time I saw him he was 350 pounds easy. I though I read Forster started signing recently. Maybe did a private signing? Am I imagining that? What about 74 Topps Celerino Sanchez. I still haven't seen one! The “R” concerns me most, although he also had a distinct “k” that had a detached completion - I don’t see that part of his “k” on the scan. The slant of several letters in the last name are also irregular, although that is sometimes typical with players signing cards with multiple players pictured. I can’t get past the first name, just too much unlike any that I have seen. Who knows sometimes, although I wouldn’t have purchased this myself. To add, he started he unique change with his “k” in 1978 or 1979 - I don’t have an exemplar from 1978. I have yet to see a single example I'd be comfortable with owning, although I've certainly owned my share of Anderson autographs on other media. Herman Hill is another one. He drowned during winter ball in 1970, and his rookie card is in the 1970 Topps set, so he certainly couldn't have that many in circulation. Also, someone mentioned Mike Miley. I grew up in Louisiana and had the chance to watch Miley as the quarterback for LSU. He was well loved in the state, so it could be that he signed a lot of cards for fans of him as a football player. Sadly, four LSU quarterbacks died in the 1967-1977 time frame including Miley, Butch Duhe, Carl Otis Trimble, and Trey Prather (who kept Terry Bradshaw on the bench in high school).